Order from Amazon stores which ship anywhere in the world. While browsing or searching on Purse, you will find items from Amazon.com. This store will ship to many places outside of the United States for an additional shipping fee. You can view the full list of destinations & rates here. We also offer limited support for Amazon.co.uk , Amazon.ca, Amazon.co.jp. Between these stores, Amazon ships most anywhere in the world. If you’re new to Wish Lists, select Create Wish List. Make sure the list is set to Public. Once you’ve added an item to your list, click the option View List to configure your wishlist. Then click List Settings in the top right. Ensure under Privacy your list is set to Public then click Submit. Navigate on Amazon to your wishlist and click Share in the top right next to the envelope. Then copy the URL from Share link pop-up. Step 5. Click Import Wish List or paste list url in the search bar. 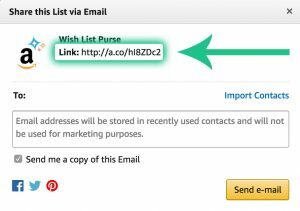 Once signed into Purse, go to the Shop page and paste your Wish List URL into the search bar at the top or click 'Import Wish List'. Ensure that the items are In Stock, not Used, or any of these items, or you may get an error. Select a discount by sliding the bar. For fast shipping, we recommend selecting a 15% discount. Bigger discounts result in longer fulfillment and ship times. Set a discount below 10% for items you need urgently. Set a higher discount for items you don’t need right away. This is a great option for larger purchases. Add items to your Wish List from Amazon’s mobile app. We'll update your Imported Wish Lists on Purse so that it's easy to checkout. You can pay on Purse with Bitcoin, Bitcoin Cash, or any other cryptocurrency by using Shapeshift. Don’t have any Bitcoin? You can sign-up at Coinbase and buy your first fraction of a bitcoin quickly and easily. Unable to use Coinbase? There are a ton of popular exchanges and brokers that sell bitcoin all over the globe, see more here.